I have been blogging about SAP and SAP SuccessFactors for a while in various platforms, but this blog is special: my first blog after I joined SAP as part of the SAP SuccessFactors Cloud Architecture Advisory team, few months back. And the timing couldn’t have been better i.e. the month of December, a month that many of us look forward to for the right reasons: the lights, Christmas decorations, smell of apple and pumpkin spice, shopping, sound of Christmas carols, anticipation of Santa’s gifts but most importantly this is my favorite month because it gives an occasion to celebrate and spread the joy and happiness with the People in our life and brings us closer to those loved ones ! And that’s what my blog is about: People! SAP SuccessFactors is adopting the SAP Analytics Cloud as the foundation to drive the people analytics agenda. Amy Wilson, Head of Product for SAP SuccessFactors, had announced it at SuccessConnect in Las Vegas earlier this year. Please refer to this blog from Amy to learn more about this announcement on our people analytics initiative: https://news.sap.com/2018/10/sap-SuccessFactors-people-analytics-enabled-sap-analytics-cloud/. SAP SuccessFactors people analytics was one of the key topics presented at the recent ASUG Express – Best of SuccessConnect roadshows that happened in major US cities. I had the opportunity to present on the strategy for SAP SuccessFactors people analytics in the Atlanta and Charlotte chapter with Mick Collins and Kouros Behzad . This blog is an extension of the content shared in the roadshow for the larger audience. Many thanks to Carolyn Beal , Kim Lessley , Janne Wise and Kouros Behzad for sharing product related information for this blog. Every organization has the ambition to be data-driven. Typically, the executive leadership’s vision is to have analytics at their finger-tips in any setting and to be able to answer questions so that managers and leaders can spend time addressing issues by providing tangible solutions instead of arguing about the source and the credibility of the data. SAP’s strategy for analytics within the Intelligent Enterprise, SAP Analytics Cloud powered by SAP HANA, is the answer to that riddle and leading the way as the game-changer since 2018 with many interesting planned innovations through out 2019. SAP’s analytics strategy has one goal: to provide one solution/tool for a familiar experience across the enterprise – all looking at the same data regardless where it sits. SAP Analytics Cloud is a new generation of Software-as-a-Service (SaaS) that redefines analytics in the cloud by providing all analytics capabilities i.e. BI, planning and predictive for all users in one product. It is built natively on SAP Cloud Platform for extreme performance, and it engages customers with simplified, new public cloud experience that they can trust. All SAP applications in the cloud (SAP Ariba, SAP Concur, SAP Fieldglass, etc.) will ultimately adopt SAP Analytics Cloud to deliver a consistent experience across the portfolio. Integrated Business Scenarios : This is where customers will get most value, by bringing data from across domains and multiple sources for integrated business scenarios and to do own modeling i.e. People data in the context of Business challenges. This scenario will require additional licensing. No intelligent enterprise can be intelligent without intelligent Human Capital Management ! So, what’s in it for SAP SuccessFactors customers? Let’s find out. Suite-wide reporting will be enabled by SAP Analytics Cloud. This will eventually replace all existing reporting tools built on the native SAP SuccessFactors platform. SAP SuccessFactors people analytics includes all of suite-wide reporting in SAP SuccessFactors, as well as advanced capabilities for workforce planning and workforce analytics. Embedded reporting and insights enabled by SAP Analytics Cloud impacts all SAP SuccessFactors customers in the near term as it will touch every single SAP SuccessFactors modules, regardless if customers have deployed one module or all modules. And this is planned for general availability in 2nd half of 2019*. What is Report Center and how it fits into people analytics ? Report Center is required for managing reporting and insights content in SAP SuccessFactors. To simplify the entire HR reporting and analytics experience in the SAP SuccessFactors HCM Suite, Report Center was introduced in Q3 2017 as one destination to create, view, and manage all types of reports and analytics. Report Center is a key pre-requisite to adopting the new reporting capabilities. Report Center is available to turn on via the SAP SuccessFactors Upgrade Center. Turning on the Report Center will continue to be an option through 1st half of 2019; however, in the 2nd half of 2019 this will be a universally pushed feature. In Q2 2019, Report Center will be a universal feature applied to all preview instances, and will be applied to all production instances universally in Q3 2019. Read the announcement in the Customer Community (login required). Suite-wide reporting: What is the impact on end-users? As reports are transitioned to suite-wide reporting, they will seamlessly become available to end users. Please visit www.sap.com/roadmaps for most recent official product roadmap. The plan is to have a phased roll out of the new capabilities. Customers can create new reports with SAP Analytics Cloud. There will be a phased transition away from the existing reporting over a period of 12-24 months (or longer depending on customer feedback). After approximately 24+ months, all reports will be in SAP Analytics Cloud. Report Center will continue to be the access venue for all reporting for admin and HR professionals. I will highly encourage customers to turn on Report Center and begin using it because this would be the persistent layer and pivot as we transition from existing tools to new capabilities. It is recommended to upgrade to Report Center as soon as possible. What does the SAP SuccessFactors strategy for people analytics enabled by SAP Analytics Cloud mean for existing SAP SuccessFactors Workforce Analytics and SAP SuccessFactors Workforce Planning customers? SAP will continue to support existing SAP SuccessFactors Workforce Analytics and SAP SuccessFactors Workforce Planning customers until they are ready to move to SAP SuccessFactors people analytics enabled by SAP Analytics Cloud. A plan is in motion to drive the long-term roadmap for delivering the SAP SuccessFactors metrics catalog and benchmarks through SAP Analytics Cloud. Currently we are planning to offer a BETA program in 2nd half of 2019. SAP Analytics Cloud is a generally available solution and customers can already begin to take advantage of its extensive capabilities together with their data in SAP SuccessFactors. SAP Analytics cloud offers predefined content and templates available for download to help accelerate deployment. What is the future of SAP SuccessFactors Workforce Analytics ? Many existing SAP SuccessFactors customers had asked this question during the ASUG events. Workforce Analytics customers can continue to drive value from their deployments for the foreseeable future. The initial focus for people analytics enabled by SAP Analytics Cloud is for new customers and a consideration for customers that have not yet implemented SAP SuccessFactors Workforce Analytics. Workforce Analytics customers will be given ample time to prepare for a transition when comparable capabilities become available. 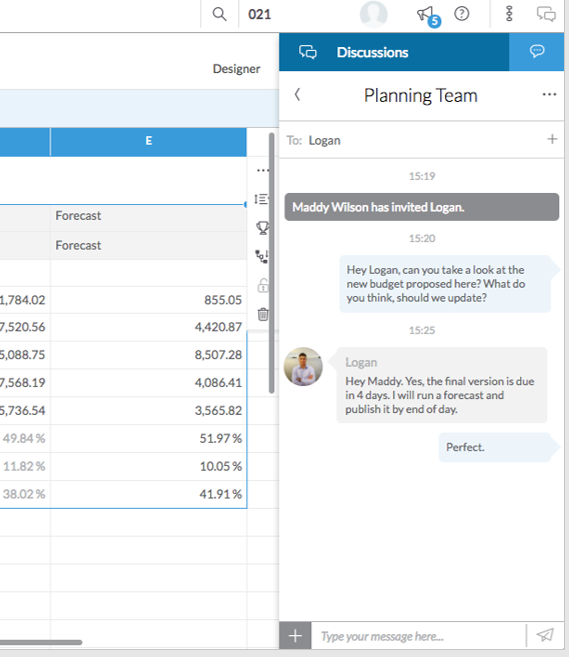 For workforce planning, there is a plan to transition capabilities from SAP SuccessFactors Workforce Planning (for operational headcount planning and strategic workforce planning) to people analytics enabled by SAP Analytics Cloud and the work has already started with the release of planning input templates, dashboards and a planning process flow that was released last month. Analytics Cloud comes with tighter integration with S/4HANA and with standard features that are critical for planning but ere previously not available in SAP SuccessFactors. For new customers, consideration should be given to using SAP Analytics Cloud. While SAP SuccessFactors Workforce Planning is still available and will be supported for existing customers, it will not benefit from new developments on the product. To use SAP Analytics Cloud for workforce planning you’ll have to import your HR data. Usually before you can import any data you have to define how it will be structured by creating a planning model. SAP accelerates this process by providing predefined templates you can use to define and load data from SAP SuccessFactors Employee Central based on existing structures and relationships. A planning model is a representation of your people data according to your defined structure. When you create your model, you’ll define hierarchical relationships between positions and determine your organizational structure according to cost center or departmental structures. Models will provide the basis for your planning in SAP Analytics Cloud. Once your model is defined, you’ll complete the process by importing your workforce data. In this stage, you can add the different types of your headcount and cost data such as actuals, budget, and forecasts. SAP Analytics Cloud incorporates collaboration tools so stakeholders like cost center managers, leadership and workforce planners can communicate in context without leaving the platform. SAP SuccessFactors people analytics strategy goes beyond the traditional analytics by enhancing well-versed decisions by detecting patterns in the data and recommending the best course of action. Modern world has very well adopted to different types of intelligent ‘smart’ devices in every walk of life and home. Intelligent services are not a new concept anymore but it is going through a metamorphic change already. There is no looking back and the sooner we adopt the ‘New’ technologies, will be more efficient. SAP’s people analytics strategy provides you that possibility to embody the intelligent services within your HR solution with SAP SuccessFactors. 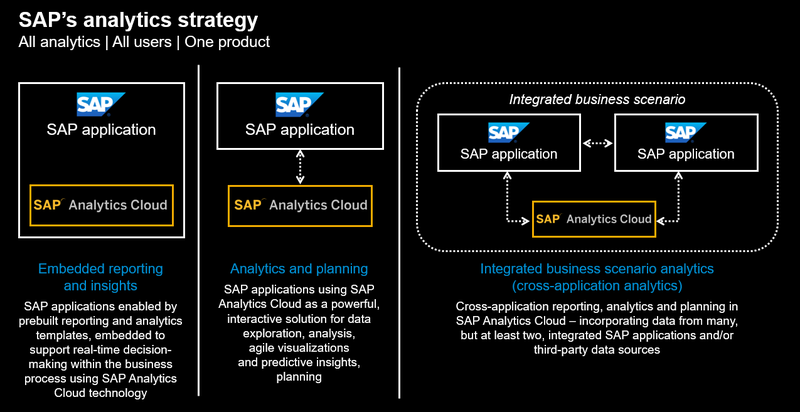 SAP’s analytics strategy, with the ‘all analytics, all users and one product’ not only provides one tool that covers all SAP solutions: on-premise, hybrid and cloud but it has lots of advantages for customers: one analytics tool to train resources on, agility to more resources across product lines, simpler technology stack and many more. From an end-user perspective, the single, consistent and modern user experience across the portfolio is just the icing on the gingerbread house ! Wow, an incredibly informative blog post, thanks so much. I still find it distressing and confusing that Jam was not embeded into SAC for the social part, that makes no sense. I would hope that when more pressing issues with the tooling are resolved (like allowing multi-year planning) that this will be fixed. I’m really looking forward to seeing much more in this space. Thank you so much for your comments ! I agree with you on the JAM part 🙂 and I hope it would be something in the future road-map, if more customers ask for it. SAC is evolving and I hope to see many interesting and exciting developments in next few releases. The blog is quite informative, found it quite useful. How to enrol in the Beta program , can you please share some details. Thank you ! If you are an existing SuccessFactors customer, you can work with your SAP CEE to be enrolled in the Beta program. If you are a partner company, you may have to work with your SAP Partner relation contact to see options for Beta program enrollment.